5 Lesbians Eating a Quiche. Photo courtesy The Boom. Hold on to your quiches! The Boom’s quick-witted, crazy good-time play 5 Lesbians Eating a Quiche is comedy gold. 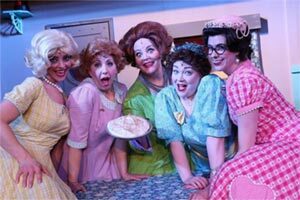 Based in 1956, five ladies of superb style and class gather together at the annual quiche contest. This passionate group, known as The Susan B. Anthony Society for the Sisters of Gertrude Stein, is prepared for anything. Armed with forks, ready to taste this year’s winning egg concoction, they gather in the community center turned bomb shelter. There, along with the audience members, they set off to taste and judge the quiches. If that doesn’t sound wild enough, just wait until the bomb sirens sound and the ladies find themselves facing down the next four years locked in the shelter together. With no quiches to look forward to, true natures quickly show themselves. And when one of their own betrays them, the oven mitts come off. Nothing short of hilarious, raunchy, and rip-roaring, 5 Lesbians will have you laughing the whole way through. 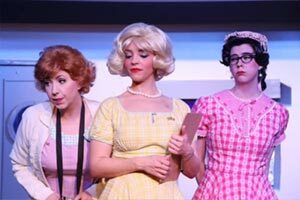 The five lovely ladies of the society are Erin Heatly as Ginny, Kara Chapman as Wren, Courtney Hahne as Vern, Jodi Nestander as Dale, and Rebecca McCauley as Lulie, the honored president of the club. They’re all perfectly pretentious, creating a hierarchy in their own ranks. The self-imposed social order decides who deserves to taste the quiches and who hasn’t yet earned their place. But soon all hell breaks loose and pretenses dissolve along with reservations. (L to R) Jodi Nestander, Kara Chapman, and Erin Heatly in 5 Lesbians Eating a Quiche. What keeps this egg afloat is the superb acting of all five actresses. Physical comedy combines with ridiculous plot twists and increasingly absurd scenarios. The women at the helm of it all hold up and deliver some uproarious moments. They also must interact with the audience, something that can be challenging as well as unpredictable. It works well and the audience is quick to participate. At one point, we all shout, “I am a lesbian! !” together as one, and it feels right. Heatly is reserved and innocent, but soon falls prey to her more primitive desires. 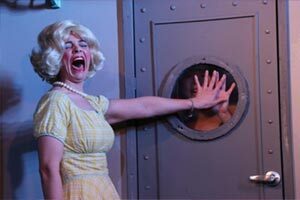 Chapman is the perfect Stepford wife, who may not actually be a wife at all. Her revelations are hysterical, with facial expressions to match. Hahne is the reasonable one who’s thought of everything. But even she can’t keep her cool when the heat and tensions rise. Nestander has a glorious backstory, and she becomes the noble heroine the lesbians need. McCauley is lofty and snobbish, but those in the highest seats have the furthest to fall. Kara Chapman lets her feelings out as Wren. A play this fun and ridiculous, with plot-points so wild, could be hard to follow and could easily fall flat. But these ladies are real pros, and they make it work in their favor. It takes a solid cast to make a silly thing like this show succeed. A true test of acting talent is comedy- not just the timing but the delivery itself. Luckily for everyone in attendance, this cast knows what they’re doing and they kill it with every line. It’s no small feat to make an audience laugh, and continue to do so, for the duration of a play. But they do it. Your sides will serve as a reminder. It’s so funny it hurts! Whatever you do, don’t be like Marjorie, bless her wretched heart. See this show while you still can!! You’ll laugh your quiche off. 5 Lesbians Eating a Quiche at The Boom runs Fridays and Saturdays until May 11th. Tickets are available at ticketstorm.com.